Sometimes you can feel like you’re under a pile of doo-doo, but later you realize (with appreciation) that it’s just meant to fertilize your life. The seed of your dream is in the ground, and it is sometimes a dark place, compounded by the compost of, well, poopy circumstances. Can I use any more childlike words to describe #$it? I know that those of you who read my posts are generally like-minded; we seek to GROW our lives, don’t we? I was 16 years old…and no, it wasn’t the captain of the football team. It was a 1981 Chevy Camaro Berlinetta. This story, however, is NOT about a car. Still, let me paint a picture for you. It beckoned to me from the showroom floor. Perhaps it was my mom’s way of honoring my dad’s memory – he was ALWAYS opposed to buying a used car. Maybe it was the pleading look in my eye. Send my classmates into a jealous frenzy. None of that happened, but what did happen was the minute I drove that car off of the lot, it depreciated by 11%. At the end of the first year, that percentage rose to 19%. I learned the concept of DEPRECIATION. Webster’s defines DEPRECIATE as to diminish in value over a period of time or to disparage or belittle. To DE-PRECIATE shrinks things. Which got me thinking about APPRECIATION. Could it be said that APPRECIATION grows things? When I water and fertilize my flowers, they GROW. Saying “thank you” or complimenting a friend GROWS a relationship. When I make deposits into my savings, that account GROWS. 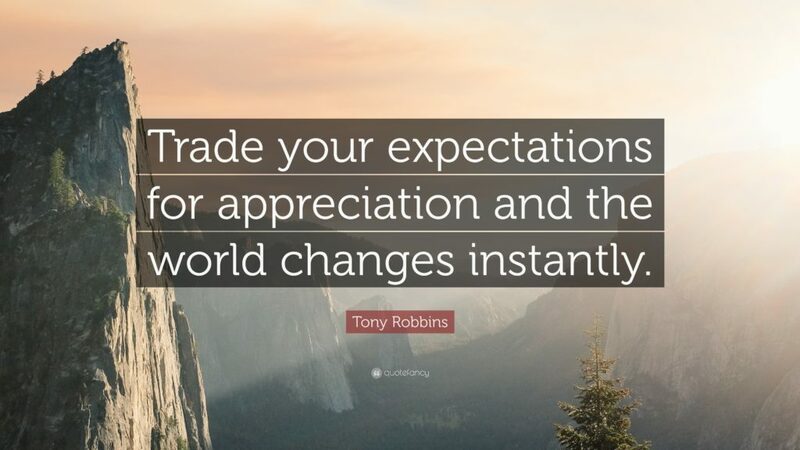 APPRECIATION is like a magical super-sizer. And your appreciation has made a beautiful day even better by the very act of appreciating it. When I throw my Burger King wrapper in my garden bed, it chokes the roots. If I don’t tend to the weeds or protect my plants from critters or pests, they fall prey. My actions – or lack – of appreciation can either SPEED or IMPEDE growth. When I moved out on my own, my Camaro didn’t have the oil changed regularly. (I hear you groaning.) It became a repository for fast food wrappers and dents and parking tickets from Glassboro State College. It eventually died on the highway. Because of the way I DIDN’T take care of it, it had steadily diminished in value. Had I appreciated it and cared for it, it might be a classic – the target of oohs and aahs at car shows. And when it comes to matters of the heart and appreciation, I think of my marriage. …and ended in shouts and divisions of property and our very lives. We stopped appreciating what we loved about each other and the marriage continued to shrink. Has anyone here been guilty of these? Me too, so how do we FERTILIZE OUR LIVES? Through APPRECIATION. Acknowledge what IS GOOD right now. Praise progress – even baby steps. Remember what obstacles you’ve surmounted. Recall how far you’ve come. And be good to YOU. Yes, be nice to yourself. Stop complaining about what you didn’t, should have or might have been or done. The past is in your rear-view mirror. You’re not going there. Regrets do NOT serve you or anyone else. Guilt is a non-productive emotion, and if you look ahead, the sun is shining – always, even behind the clouds. I want my life to GROW. I want MORE GOOD STUFF – and I don’t want to take the blessings of life for granted until they de-preciate from view. What do you love – who do you love, RIGHT NOW? AND WATCH YOUR LIFE GROW. It’s a mandate to go with the flow, my friends. May that flow take you ever closer to the life you’ve imagined.